Let’s face it: people hate outbound advertising. Over the years it has become incredibly intrusive, filling up our Inboxes and cluttering up our web pages. The ongoing barrage has made us relatively numb to the content, as we search in vain for the tiny hidden ‘X’ that will magically banish it from the page. Sure, you occasionally get a cute commercial or relevant topic. But by-and-large it’s simply an irritant from which most people try and escape. So how are you going to set yourself apart amidst all this chaos? Well, how about engaging a strategy that makes your customers come to you? It might sound too good to be true, but it isn’t. If you’ve ever seen a successful blog, newsletter, video snippet, podcast, or social media post, then you’ve been exposed to inbound marketing. The idea behind it is simple: create value for the customer, place it prominently for them to find, sit back as they discover it… and then come running directly to you. Quality online content earns customers’ attention as a result of interest and relevance. And when they find the article/blog/newsletter particularly helpful, they are likely to check out the author, the company, and any links contained within it. Those roads all lead back to you and your business, and customers will follow them right to your door. Aside from the ease of getting customers to come to you, you are also likely to notice it can be significantly cheaper than traditional outbound campaigns. That’s because you aren’t paying to purchase a list, or being invoiced for every random ‘click’ you receive. Another perk: The quality of customers showing up on your site is going to be much, much better. What do we mean by this? Well, they are likely a member your specific target audience, within your geographical range of service, and currently experiencing an issue or problem that your company is uniquely qualified to help them solve. Your likelihood of converting that person into a paying customer is significantly higher than any old Joe Schmoe, who happened to click an ad off to the side of his browser page accidentally. If all of this sounds appealing to you, then consider our specialized inbound marketing package. We’ve taken years of marketing experience, collected it, refined it, and created an off the shelf solution well suited to any industry. What’s more, we’ve specially designed the program to ensure it’s flexible enough to meet your goals, brand identity, personality, and business function. It provides any business with a roadmap to inbound marketing success, and the tools necessary to help your company reach the next level. Don’t waste any more of your hard-earned dollars on campaigns that won’t convert. Call us today and learn about how our inbound marketing package can deliver you quality customers for a single, fixed price. The MarketBlazer Inbound Marketing Program is for Small Business owners that want to focus on being found organically in search engines. We will optimize your website for local search and make sure Google and the other search engines understand your business and your market area. We will optimize your Google My Business listing for rankings on Google Maps. 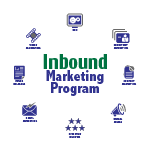 With the Inbound Marketing Program you will have a step-by-step system to guide satisfied customers through the easy process of leaving a positive review and dramatically increase your positive reviews.